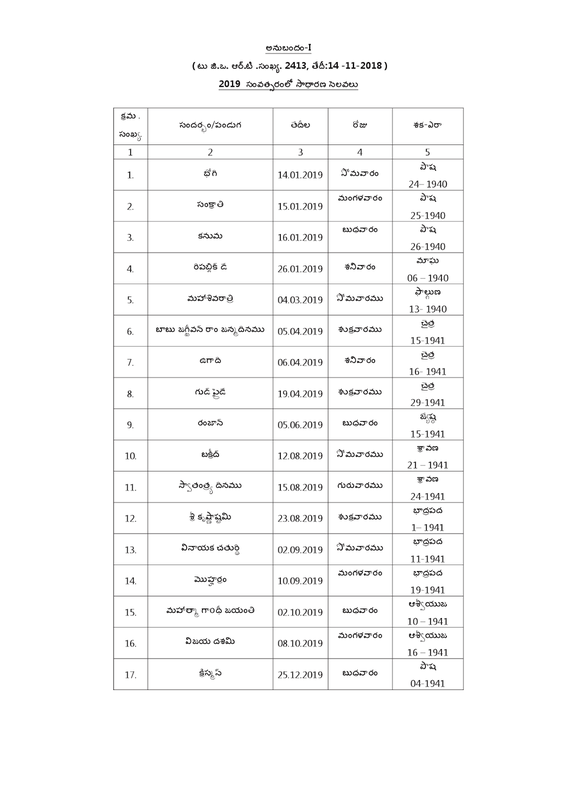 The Government of Andhra Pradesh direct that the days specified in Annexure- I shall be observed as General Holidays by all the State Government Offices excluding the holidays falling on Sundays shown in Annexure-I (A) and Optional Holidays shown in Annexure-II except the Optional Holidays falling on Sundays shown in Annexure- II(A) during the year 2019. 1. In pursuance of the orders of the Government in G.O.Ms.No.68, School Edn. 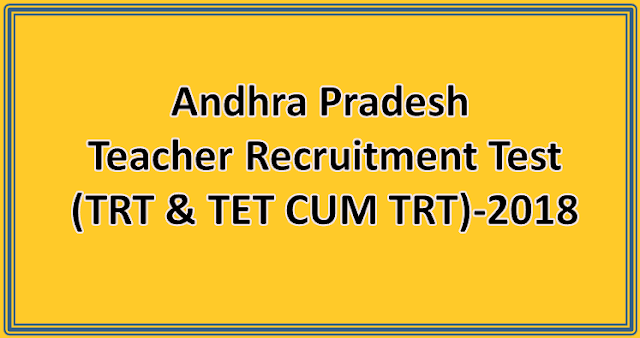 (Exams) Dept., dated:26/10/2018 applications are invited for appointment of teachers through “Andhra Pradesh Teacher Recruitment Test (TRT)”. 2. The application format is to be made available in website from 01/11/2018 to 15/11/2018. The eligible candidates can make application online for recruitment to the posts of Principals, Post Graduate Teachers(PGTs), Trained Graduate Teachers(TGTs), Physical Education Teachers(PETs), Craft, Art and Music Teachers in AP Model Schools, AP Residential Schools and APBC Welfare Residential Schools in the State through Selection Committee..
4. The applicants are required to go through the Information Bulletin carefully and should satisfy themselves as to their eligibility for this Recruitment, before making payment of fee and submission of application. 5. The Information Bulletin will be available on website (http://cse.ap.gov.in) from the date of notification which can be downloaded free of cost. 6. The applicants have to pay a fee of Rs.500/- towards application processing and conduct of Recruitment Test (for each post separately) through Payment Gateway from 01/11/2018 to 15/11/2018. 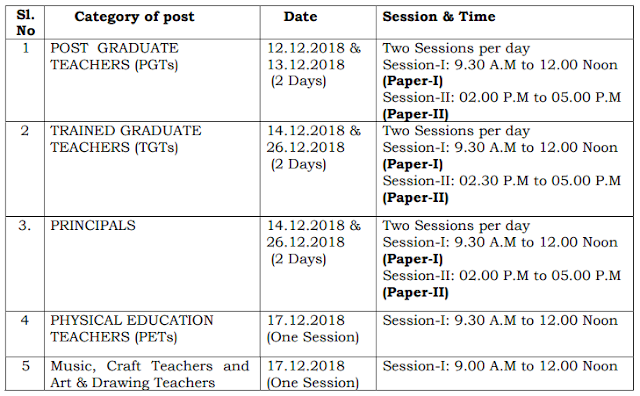 The last date for payment of fee is 15/11/2018 and last date for submission of application online is 16/11/2018. On receipt of fee the candidate shall be issued a ‘Journal Number’ with which he/ she can proceed with submission of application online. Issue of Journal Number does not mean that the candidate has completed submission of application online. It is only a confirmation of the fee received. 7. The step by step procedure for submission of application through online will be given in USER GUIDE on website (http://cse.ap.gov.in) which will be made available from 01.11.2018. The post-wise vacancies in each district will be available in web site (http://cse.ap.gov.in) from 01.11.2018. 8. AGE: No person shall be eligible for direct recruitment to the post of Teacher if he/she is less than 18 years of age and not more than 44 years of age as on 1st day of July of the year 2018 in which the notification for selection to the relevant post, category or class or a service is made. However, in case of SC / ST / BC candidates the maximum age limit shall be 49 years and in respect of Physically Challenged candidates the maximum age limit shall be 54 years. Upper age limit for Ex-service Men: A person, who worked in the Armed Forces of the Indian Union, shall be allowed to deduct the length of the service rendered by him in the Armed Forces and also three years from his age for the purpose of the maximum age limit. 9. 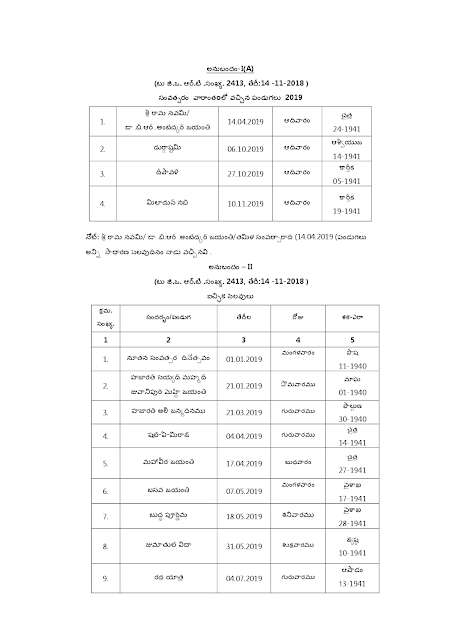 Qualifications: Post-wise qualifications as prescribed in G.O.Ms.No.68, Edn., dated: 26.10.2018 are given in the Information Bulletin. 10. 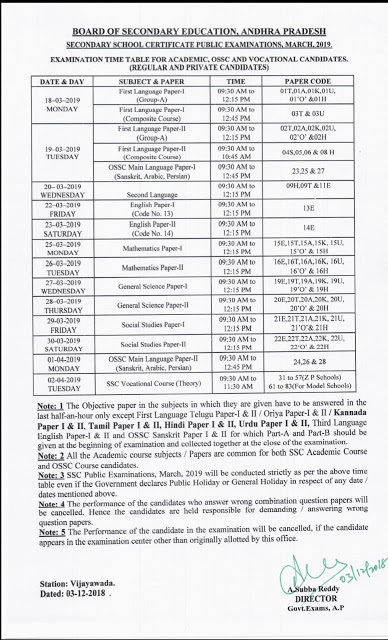 Written Text (CBT):- The Computer Based Test shall be conducted in all the districts. A candidate shall appear for the Computer Based Test in the district in which he/she seeks recruitment (or) in neighbouring districts of adjacent states. 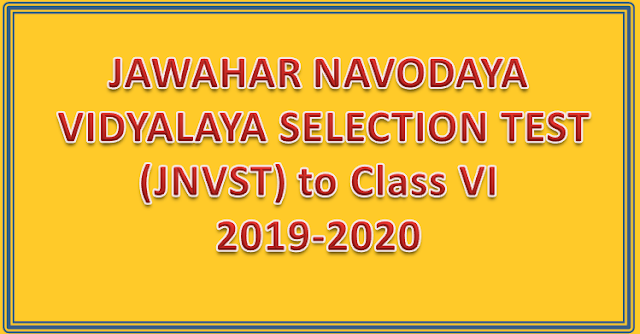 for all Jawahar Navodaya Vidyalayas. 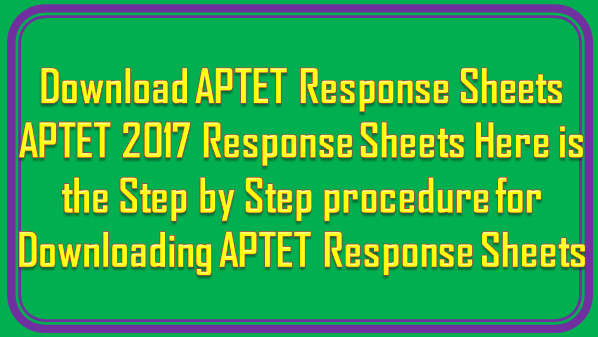 Response Sheets will be available from 26th March 2018 onwards. 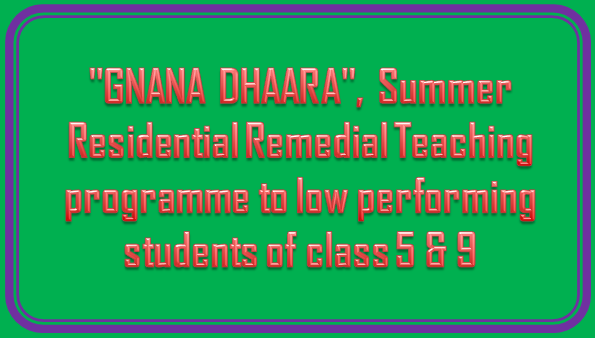 Sub: School Education - Learning Enhancement Programme -"GNANA DHAARA", Summer Residential Remedial Teaching programme to low performing students of class 5 & 9 - Preparatory activities - Guidelines to District Educational Officers - Issued - Reg. 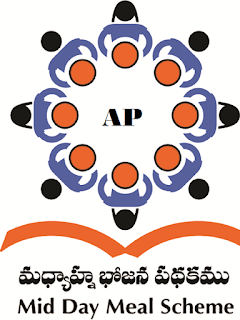 Attention of all Regional Joint Directors, School Education (RJDSEs), District Educational Officers (DEOs), District Project Officers (POs) and Academic Monitoring Officers (AMOs) to Honble Chief Ministers vision for School Education and direction that Andhra Pradesh should be among the top three performers in the country in National Assessments of Student Learning Outcomes by 2022. In order to achieve this vision, the Education system needs to equip its students not only with literacy and numeracy. but with knowledge and skills relevant for the 21th Century. Recently conducted National Achievement Survey (HAS 2017] and Annual Status of Education Report [ASER 2017] surveys mirror the results from the recent Summative Assessment [SA-1] conducted in objective mode for Classes 8th and 9th While NAS showed a declining trend in performance of AP students moving towards Upper Primary and Secondary Education ASER revealed that barely 59% of the youth in Srikakulam district could do basic division. Further, analysis of the results of Class 9 students of SA1 revealed that 51%, 47% and 25% of the students secured D1 and D2 grades, in Maths, Science and English subjects respectively. In view of all these findings, and in line with the directions of Hon'ble Chief Minister in ref. 3 cited, the School Education Department is developing a clear action plan to address gaps identified in NAS. ASER and other assessment reports. As discussed with MI-IRD and Sp. Chief Secretary. School Education during review meetings. there is a need to put in place a sustainable model of remedial teaching with the objective of bringing low performing students to grade level. Further. recent data on drop outs shows that nearly 22,000 students dropped out in transition from Class 9 to Class 10 in AY 2016- 17. Students who are entering Class 6 are also transitioning from Primary Schools to High Schools without appropriate grade level competencies thus impeding their ability to cope up with the syllabus at High School. The resultant plan of action for long term remediation for low performing students in all grades. called Gnana Dhaara is designed. A comprehensive Remedial programme is proposed to be conducted to the identified low performing students in all grades under different managements. The remediation program called Gnana Dhaara will be conducted in 2 phases') Summer Residential Program and n) Year long Learning Enhancement Program. This program will focus on improving learning levels of students of all Govt. and government aided private schools. Support will be provided by way of workbooks. teaching guidelines to Private school managements too. Teaching Learning material and Student-friendly workbooks will be designed and provided by School Education Department. 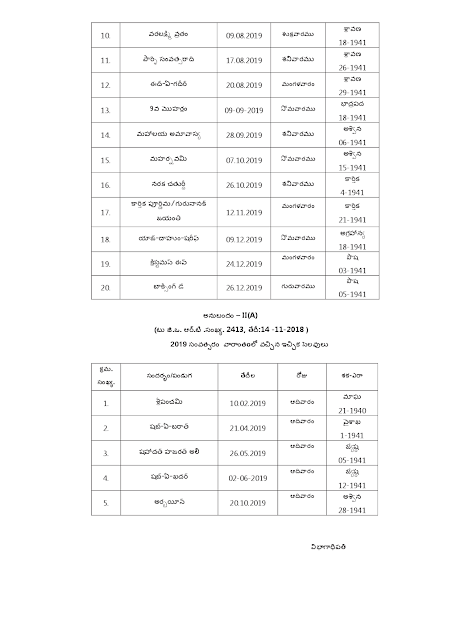 Respective managements to use them for remedial coaching program. For whom: Students entering classes 6 and 10 in AY 2018-19 will be considered. to help them bridge the transition from primary school to high school. and to give the Class 9 students confidence while going into Class 10 (SSC Board). Subjects: Maths. 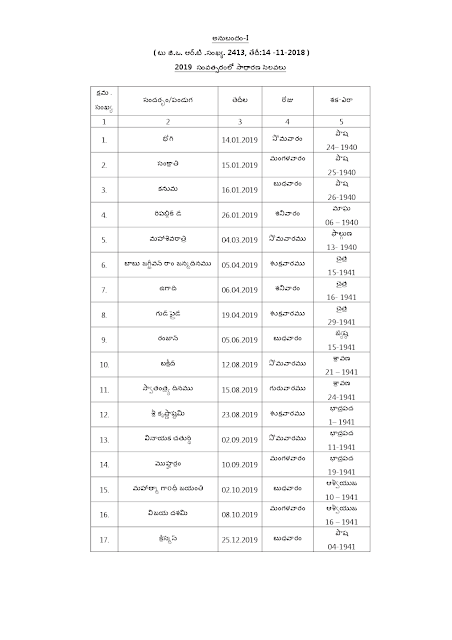 Language and Science will be the focus subjects for Class 10. while Telugu. English. Science and Maths will be the focus for Class 6.
with interest and to improve their skills. Where: Residential program involving Residential hostels of Social Welfare. Tribal Welfare. Minority Welfare. BC Welfare. APREIS. AP Model Schools. KGBVs and Girls Hostels will be utilized. In case of any shortage of residential campuses in any district. 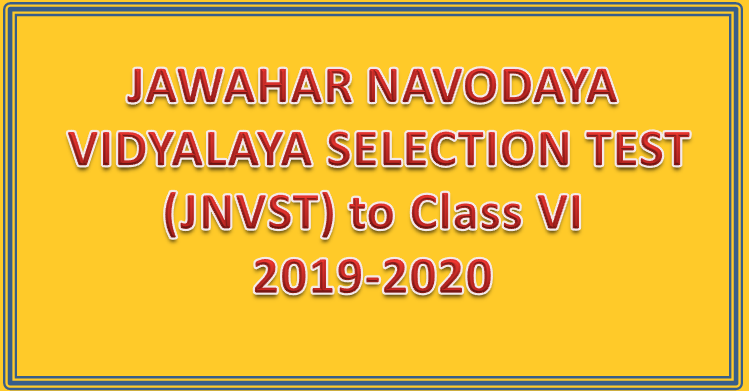 the campuses of Pnvate Engineering colleges or Corporate Schools/ Intermediate colleges are also to be engaged post consultation. Training to teachers: Teachers will be oriented through teleconferences shortly on their roles and classroom strategies, and online training for familiarization of the remedial content will be undertaken. Coverage of students: Based on SA-I results. around 2.30,000 class 9 students and 56.000 class 5 students are identified to participate in GNANA DHAARA summer residential programme. Extra-curricular activities are planned through local partners and organizations to provide holistic learning and development to child. Advance information and communication will be sent to SMCs and Parents. The Summer Residential Remedial program is intended to smoothly transition into the sustainable year-long continuous remediation. ensuring the flow of knowledge or Gnana Dhaara. The year-long remedial program for all classes would be integrated with regular classroom teaching to provide continuous support to the low-performing students so that learning gaps can be addressed as and when they arise. All District Educational Officers are appointed to the overall in-throne of the programme in their district and the success of the program. They are requested to implement the program in close coordination with POs. Dy. EOs. DIET Principals. AMOs and District Assessment Cell [DCEB] members. 1. Dissemination of Concept Note- GNANA DHAARA concept note is enclosed with these proceedings. A copy of this note should be circulated to all the stakeholders-POs. Dy. EOs. MEOs. DIET Principals. School Complex HMs. etc. 2 Creation of a pool of teachers- Identification of English. 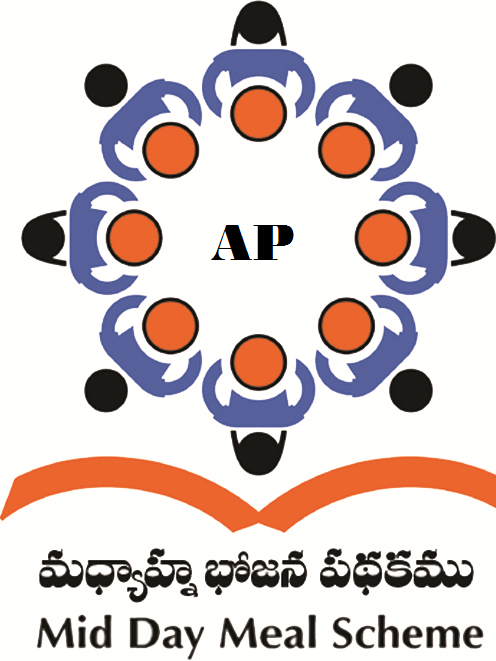 Mathematics, Physical Science, Biological Science, Telugu and P.E.T.s/P.Ds teachers, with minimum 20 teachers in each subject per mandal. The selected teachers should make themselves available for this programme in summer. However, final selection will be subject to the number of venues and requirement of teachers. ii. The selected teachers must have a deep knowledge of the subject and should be well versed in activity based pedagogy. iii.Teachers must be willing to give a self declaration to the Dept. staling they are interested in working for the said period as per guidelines specified by the Dept. in the GNANA DHAARA programme. iv. Female teachers are to be preferred in hostel campuses where girls would be residing. MEOs can lead the pooling process by nominating teachers. however the final list of teachers must be approved by the DEO. before submission to the Dept. Teachers must be conveyed that they will receive Earned Leaves as per Rule FR 62(b). Additionally. D.Ed students must be informed about the program, and selected to serve as in-house teachers at the hostels for the period of 30.04.201831.05.2018. 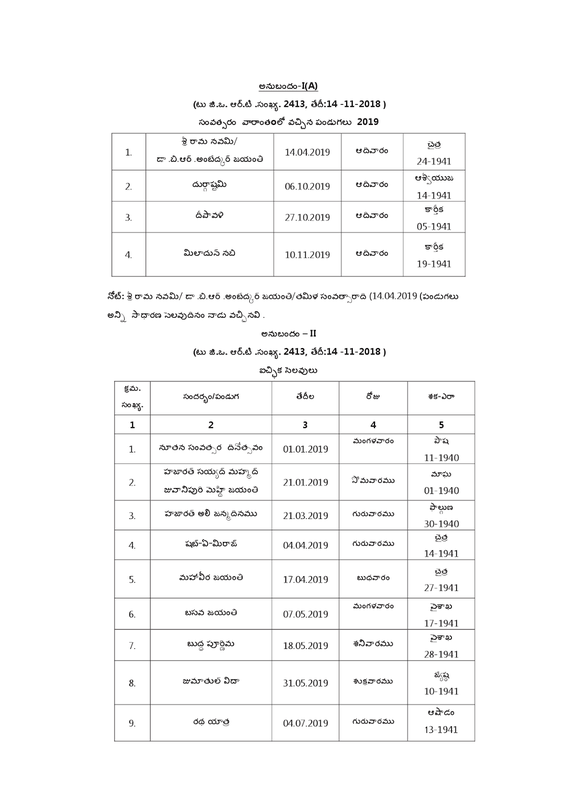 List of selected D.Ed students must be collated at the district level and sent to the Dept. 3. Campus selection- Pnncipals of SW/ TW/APMS/ APREI/ KGBV schools must be engaged in discussion to confirm the capacity of their hostels. list of facilities available at their hostels. number and duties of their staff, and overall conduciveness of the campus to conduct the programme. 4 Selection of additional venue- 4 to 5 Pvt. Engineering colleges or Pvt /corporate school campuses with hostel facility per each education division. must be identif ied and kept reserved for the programme. 5. Safety and security- Principals of S.W/T.W./A.P.R.I.E.S./APMS/KGBV schools must be leveraged to identify highly secured campus to put up a separate campus for girls. 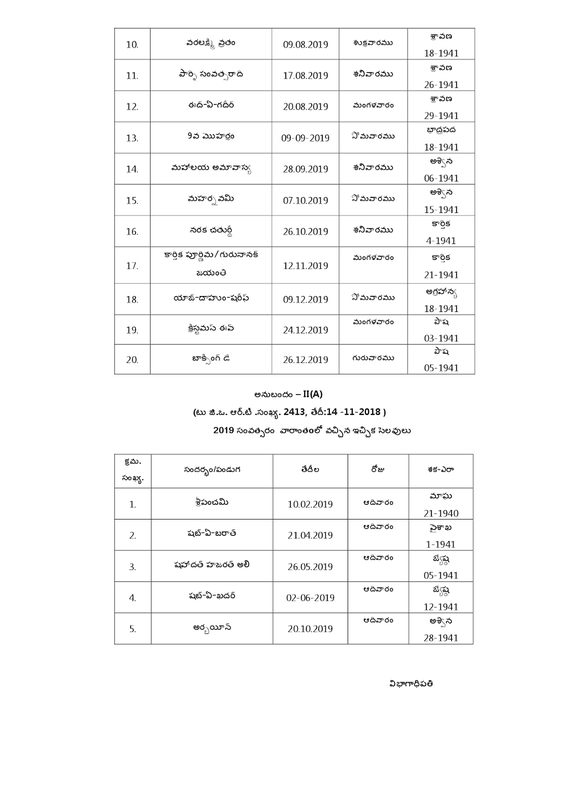 Additionally, list of students along with emergency contact details of each student. must be provided to all nearby police stations. 6. Engaging Guest faculty- Convene a meeting with local NGOs/Personality Development experts/Motivational speakers/cultural programmes organizers/YogaiMeditation experts /Art experts and chalk out how their services can be utilized at the venues. NGOs must be engaged with the Dept. solely on volunteer basis. Each district must provide a list of minimum 5 organizations which would be willing to work in their hostels. in any of the above co-curricular category mentioned. 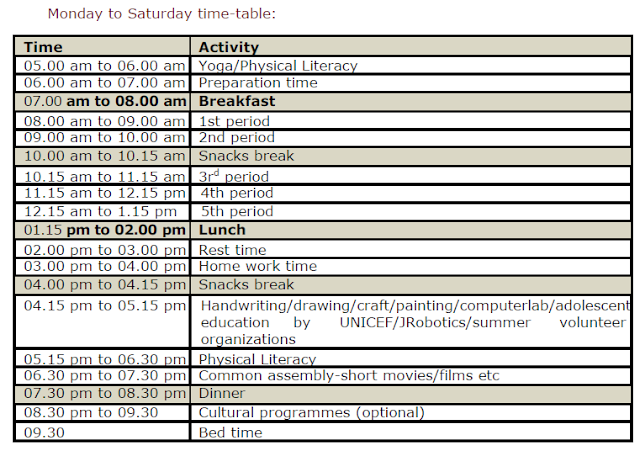 The time slots available for co-curricular activities are mentioned in the concept note. 7. Awareness about the programme- Together with District Project Officer. a meeting with Dy.EOs. Sectorial Officers SSA. Principal DIET. MEOs and District Assessment Cell [DCEB) members must be convened and roles and responsibilities fixed specifically by assigning cluster wise in-charges. Opportunities to utilize the services of D.Ed Students in the summer camp may also be pursued. MEOs must be guided to make the teachers aware of the programme, who in turn communicate the same to the parents and prepare the parents and students to get ready for it. While creating awareness among parents about the programme. care must be taken to not portray the performance of their child in a negative light. The message to be delivered is that the Dept of School Education is happy with their child's attendance in school and that to bolster the child's academic performance, as well to help the child develop in co-curricular activities, the Dept. has undertaken this programme. It must be portrayed as an opportunity for the child to learn and grow, and parents must be encouraged to send their children to the camps. Further, you are informed that regarding the modalities of the said programme, a meeting with all the key stakeholders will be conducted at CSE office, due shortly. 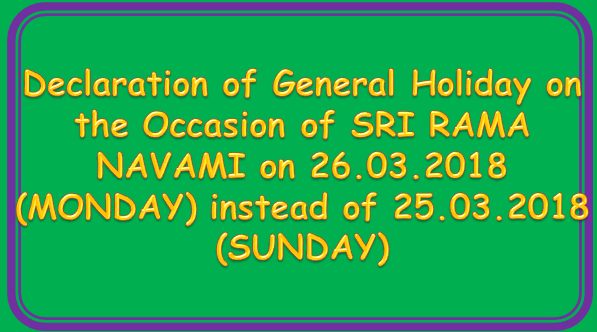 In view of this, all the District Educational Officers are requested to take action immediately on the above said items and send your feedback report on or before 26.03.2018.
c) c)Multiple checkers can also be allowed .But one checker shall be allowed only one HOA. a) Click on Bill Generation Module (BLM) Bill Lifecycle Management b) Click on Create Bill. a) The checker shall verify all the necessary requirements for the bill. b) The checker cannot make any modifications in the bill. 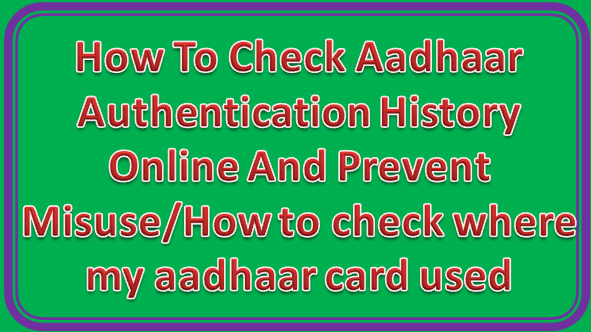 c) Eight digit employee id will be assigned by CFMS in place of existing employee id. d) Bill number shall be written on each and every enclosure before scanning. i) The salary bills shall be generated inDDO Request as per existing procedure. ii) The Bills shall be submitted in DDO Request as per existing procedure iii)TBR Number will be generated as per existing procedure. d) The Verifier cannot return the bill to the Auditor/DDO directly. e) The role of verifier is not mandatory. d) Provided and return to the DDO with his/her digital signature. e) FIFO is enabled DDO wise and HOA wise. 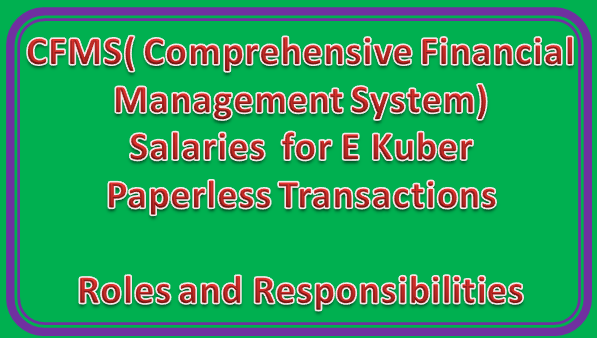 P a yme nt to Bene fici a r y A/c through “e -Kuber Payment Gateway. Account and booked in the concerned Sub Treasury Accounts. d) The remitter can remit the amount in any SBI branch at any place of his choice e) The payment can be made either in cash or through net banking. f) Challan number will be generated on payment of the amount only. g) The challan number is unique for the entire state. i) The citizen / Department can take out Print in CFMS Portal using the Form Number /challan number received earlier. Sub:- School Education - The Cigarettes and Other Tobacco Products (Prohibition of advertisement and regulation of trade and Commerce, Production, Supply and Distribution) Act 34/2003 Conduct Anti-Tobacco Awareness and preventive campaigns in all Offices & Schools and Display of Boards in all Educational Institutions - Instructions - Issued. All the Regional Joint Directors of School Education / District Educational Officers / Principals of DIETs, CTEs, IASEs in the State are informed that, in the ref. 1st read above, Govt. of India enacted the Cigarettes and Other Tobacco Products ( Prohibition of Advertisement and Regulation of Trade and Commerce, Production, Supply and Distribution) Act , 2003 (34/2003)" for prohibition of smoking, tobacco products, advertisement and regulation of trade and commerce, production, supply and distribution. Further, in the ref. 2nd read above, Govt of India has issued amendments from time to time. In the Amendment, dated: 19-1-2010, Govt. of India the following rules were incorporated to the Act 34/2003. 1. Educational institution" means any place or centre where educational institutions are imparted according to the specific norms and include any school / college and institution of higher learning established or recognised by *me an appropriate authority. i) The owner or manager or any person in charge of affairs of they educational institution shall display and exhibit a board at a conspicuous place outside the premises, prominently stating that sale of cigarettes and other Tobacco products in an area within a radius of ne hundred yards of educational institution is strictly prohibited and that is an offence punishable under Section 24 of the Act with fine which may extend to two hundred rupees. ii) The distance of one hundred yards referred to in sub-rule (1), shall be measured radially starting from the outer limit of the boundary wall or fence, as the case may be of the educational institution. Further, the Health & Family Welfare Department, Govt., of India has furnished the following information on usage of tobacco and its repercussions, diseases etc., to create awareness and to take preventive steps among the public / students. Copies of the pamphlets on the points are enclosed herewith. 6) What in Reality are Tobacco usage consuming? 7) How does the Tobacco industry target youth? 9) What youth can do? 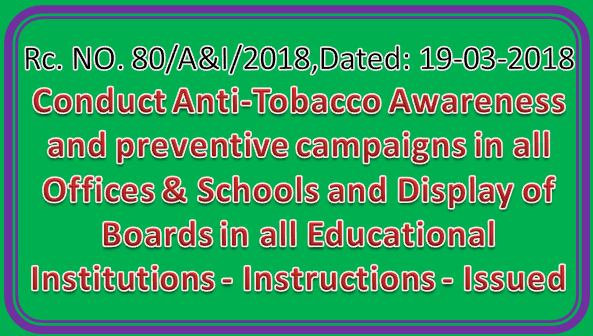 Therefore, all the Regional Joint Directors of School Education / District Educational Officers/ Principals, DIETs, CTEs and IASE are requested to conduct Anti-Tobacco awareness campaigns and to take preventives steps in their respective offices and also issue necessary instructions to all Field officers / Headmasters of all schools to conduct Anti-Tobacco Awareness Campaigns and to take preventive steps in their jurisdiction, duly following the above guidelines. Further they are also requested to take all necessary steps to display of Boards in all Educational Institutions of all managements as per the above said instructions (Amendment, dated: 19-1-2010 to Act 34/2003) without fail and submit compliance.